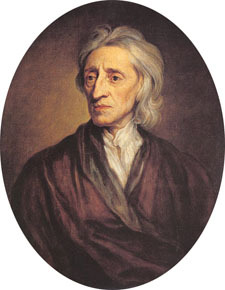 John Locke was one of the most influential thinkers of the Enlightenment. His writings form the basis for many modern political ideas. Nathaniel Philbrick. 2006. Mayflower: A Story of Courage, Community, and War. New York: Penguin, 41. François Furstenberg. 2008. “The Significance of the Trans-Appalachian Frontier in Atlantic History,” The American Historical Review 113 (3): 654. The first such tax to draw the ire of colonists was the Stamp Act, passed in 1765, which required that almost all paper goods, such as diplomas, land deeds, contracts, and newspapers, have revenue stamps placed on them. The outcry was so great that the new tax was quickly withdrawn, but its repeal was soon followed by a series of other tax acts, such as the Townshend Acts(1767), which imposed taxes on many everyday objects such as glass, tea, and paint. 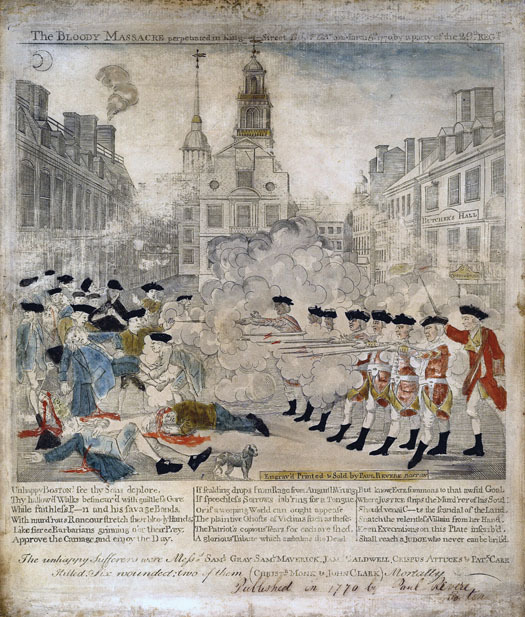 The Sons of Liberty circulated this sensationalized version of the events of March 5, 1770, in order to promote the rightness of their cause; it depicts British soldiers firing on unarmed civilians in the event that became known as the Boston Massacre. Later portrayals would more prominently feature Crispus Attucks, an African American who was one of the first to die. Eight British soldiers were tried for murder as a result of the confrontation. Bernhard Knollenberg. 1975. Growth of the American Revolution: 1766-1775. New York: Free Press, 95-96. 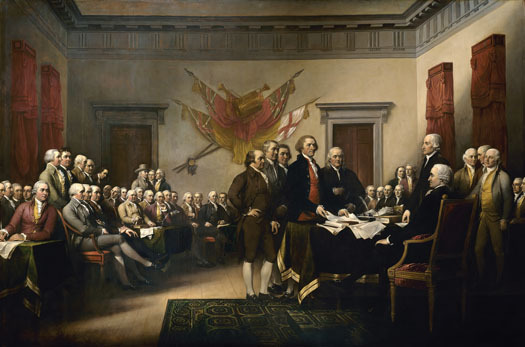 The presentation of the Declaration of Independence is commemorated in a painting by John Trumbull in 1817. It was commissioned to hang in the Capitol in Washington, DC. British colonists in North America in the late seventeenth century were greatly influenced by the political thought of ________. The agreement that citizens will consent to be governed so long as government protects their natural rights is called ________. What key tenets of American political thought were influential in the decision to declare independence from Britain? What actions by the British government convinced the colonists that they needed to declare their independence?